Congratulations on another RITA nomination, Anne, and on The Winter Bride, too, a very enjoyable read. Thanks for another enjoyable Friday Feast, too, Anne and Cathryn. Those muffins/friands look delicious! Thanks Christine — it’s a thrill to final in the RITAs. And try those friands — they really are easy and delicious. Ooh, you’ve already read The Winter Bride, Christine? Lucky you! I can’t wait to get stuck in. Thanks Kimia, it’s beautiful isn’t it? I am blessed with that cover. I can’t decide whether I like the US or Australian cover, Kimia. They’re both beautiful. Thanks Alisha, I’m so glad you like my books. And yes, I love that cover too. I love them too, Alisha! Thanks Cathryn – lovely of you to have me on here as your guest, and thank you for the gorgeous comments about my books. Truly, those friands are so easy and delicious — give them a go. I have guests this weekend and these would be perfect for them. And I happen to have all the ingredients on hand. Too easy! Great post Cathryn and Anne. I cannot wait to read WinterS Bride. The excerpt made me laugh so longing to dive into whole book. Hopefully with friands disguised as muffins. Freddy is so much fun. Thank you and best wishes on your golf Cathryn and your fab book Anne. Ps. Super mega congrats on Rita nomination !!!! Thanks, Alison — the nomination was a thrill. I hope you enjoy the muffins and the book. Freddy sounds an absolute hoot, doesn’t he, Alison? I’m sooo looking forward to his story. Thanks for the golf best wishes. Give the way I play, I kind of need them!!! Isn’t Anne’s Rita nomination wonderful? I so thrilled for her. I love your books! You are fun to read and I often find myself laughing out loud about your whit!! I hope I get chosen to read your new book since I can’t afford it for a while. Thanks, Tami — this book (if I say so myself) does have a few funny bits in it — I had a lot of fun with the hero, Freddy. I hope you enjoy reading it as much as I did writing it. What a lovely comment, Tami. Wishing you all the best in the draw. Anne, congratulations on the RITA final news. That’s excellent! I hope Damaris and Freddy have a muffin-free life ahead of them. In the meantime, these look scrumptious. Just the thing to perk up a gloomy day like today. Thanks so much Annie. Yes, I expect Freddy and Damaris will have fewer muffins in their lives – though perhaps a few friands would be acceptable and even historically possible. Damaris can cook. They look the perfect antidote to misery weather, Annie! Imagine, Anne’s friands, a cuppa and a copy of The Winter Bride. Who care’s if it’s raining! Congrats on the RITA nomination, Anne! Freddy and his ‘muffin’ debacle sounds like a lot of fun for the reader. I had to laugh about your US muffin experience, Cathryn. I’ve never heard of Friands…but they do look yummy! It was my muffin experience, Marcy, not Cathryn’s — though she might have had something similar. But I remember that waiter’s sneer to this day. 🙂 The Friands are as easy to make as muffins — there’s just ground almonds in them, that’s all. French friands are made in special oblong friand trays, but mini muffin trays are perfect. Nope, no US muffin experience for me. But I have had my fair share of waiter sneers! 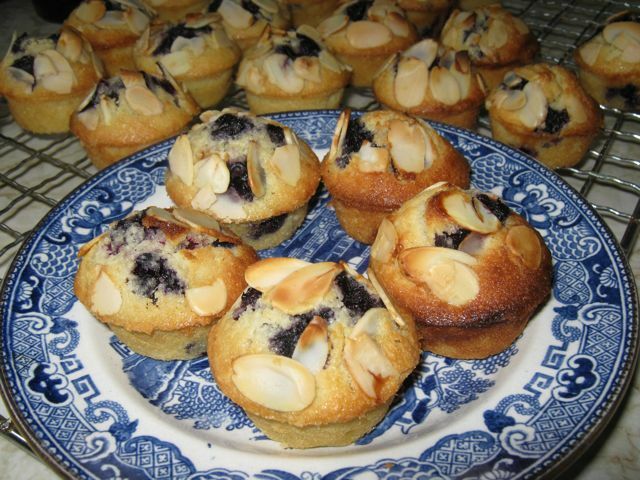 Friands are delicious, Marcy. Give them a go. Rob, a fresh hot scone is a beautiful thing, I agree. I think good red jam and cream is my favourite, but butter and honey is a close second. Thanks for joining in. firstly HUGE congratulations on your RITA nomination. I LOVED Autumn Bride so much and it would be extremely cool to see you triumphant in Texas, picking up a RITA trophy for Winter Bride. Have my copy of Winter Bride ready for the weekend, as my prize for working all week. Lovely tempting snippet of the story here. Thanks so much Fiona — so lovely of you. As for the RITA — there are 17 finalists in my category, so it’s odds against, but I’m just really happy to make the final cut. Hope you enjoy the Winter Bride. It would be VERY cool to see Anne triumphant, Fiona. I don’t think she’ll be short of home country cheers, even if they will be yelled from afar. Have fun with The Winter Bride this weekend and thanks for the congrats. Exciting times! Can’t wait for Tuesday to get my copy of the Winter Bride! My favorite thing to have with a cuppa is soft ginger cookies! I love ginger cookies, Priscilla. Mmm, gingernuts, I haven’t make them in ages. And I love the scent of fresh-baked gingernuts wafting through the house. As for Tuesday — in Australia The Winter Bride has just gone on sale this week. Oh, ginger cookies. Now I want some of them too. Congrats Anne, I have my copy tantalising me but it’s a case of – Finish The Book, Marion, and it’s yours. It’s the best ever carrot at the end of my writing string. I adore your Chance sisters. And commiserations on the Golf, Catherine. My dh and I kayak near a gorgeous little island golf course – Swan Island near Queescliff in Victoria. The shore line is shallow and bottoms out to beautiful sea grasses – and golf balls stand out like little white beacons. We take them home, clean them up and donate them to Cottage By The Sea, a holiday place for disadvantaged kids. So we figure golfers having bad days are manna from heaven. Thanks Marion, I think that kind of treat you and Fiona are talking about is the kind that rewards everyone — we all benefit from new yummy, Marion Lennox and Fiona McArthur books. They also go beautifully with a cuppa. Now that’s what I call an excellent incentive, Marion! I’ve been to Swan Island – a long time ago, admittedly – but I can just imagine all those mis-fired golf balls. That’s a lovely thing to do with the balls. I’m not sure what happens to mine. I hit so many in the dams though, that I have terrible fears about polluting the place! SO want to read this book!! But I have a problem with the question. I don’t do cuppas (no tea, no coffee). Will Milo or Diet Coke work? Because then I have a plethora of answers – my favourite thing is probably chocolate cake, but warm banana bread with butter is a close second, followed by Hot Cross Buns (hey, they’re in my mind atm) and Easter Eggs 🙂 Basically anything sweet. I’m easy… but don’t tell! A cuppa is anything you want to drink, Rach, so yes to Milo or diet coke or anything else. Chocolate cake or warm banana bread sounds so yummy. And yes, hot cross buns, yum. My nephew had a breadmaker and used to make hot cross buns by the dozen at family easters — the house smelt amazing. Thanks Lisa, it was a thrill to final. This is a really good gluten and dairy free recipe. It’s hard to get good ones that don’t involve shopping for separate ingredients, isn’t it? Hope you enjoy it — and the book. Now that’s an idea, Lisa. So many people need gluten-free food, so that’s excellent to know these friands fit the bill. Thanks Catherine, that is a lovely recipe, Anne – I have had them before and can vouch they are yum! Anne, massive congrats on you RITA nomination for The Autumn Bride. I am loving the Brides series and am about to dive into The Winter Bride. I told myself I would save it till this book was gone but I was lying to myself again. I can’t wait. Yes, these friands are yummy. I’m a big fan of simple recipes and I often take these to friends’ places. Hope you enjoy my Winter Bride. Ha ha, on the lying to yourself, Carol. The Winter Bride is too good to wait for! I already have my mitts on The Winter Bride, but now I want friands. And Freddy can have the muffins. I’m all about the compromise. Hmm, Kelly, tricky to be baking friands in a hotel room, where i am at the moment. Maybe you’ll have to come to Melbourne to visit me one day. Or I can bring them to you. Love your compromise. Thanks for popping by. Sounds like Freddy has all kinds of muffin problems, Kelly! Muffins were delightful in The Autumn Bride! I normally would want some strawberries to go with a cup of tea, or any sort of drink. They are sweet and savory. Congratulations on being a RITA Finalist, Anne! Thanks so much Helen. I love strawberries. I’m in Queensland at the moment and the strawberries I had for breakfast yesterday were ambrosial. Love this! And those MUFFINS look delicious. I’ve pre-ordered my copy, and have scheduled the day for reading when it arrives. I’ll never be able to look at a muffin in the same light. How will I explain it when someone else talks about muffins and I snicker? I suppose I’ll have to tell them about Freddy… and one thing leads to another. LOL Judy — I wrote a book once and used doughnuts in a naughty way and so many people said they could never look at a doughnut quite the same way again. At least these muffins aren’t naughty — annoying to our hero, but that’s all. And the friands are delish. Thanks for dropping by. They’ll all have to go out and buy The Winter Bride to learn all about muffins, Judy! Oh, I can’t wait to read this book! I so enjoyed Freddy in the last one – and what great news about the RITA Finals! I don’t really drink tea, but I do love a not-too-rich cake for afternoon tea. Lemon cake with a lemon drizzle icing, perhaps, or an apple cake, or a nice, fruity, gingerbread. Beautiful. Thanks so much, Catherine, I’m thrilled about the RITA final. And i hope you’ll enjoy Freddy’s transition from entertaining fribble to a hero I hope you’ll really love. You’ve just reminded me of my grandmother’s famous apple slice. A delicious apple slice with slightly sweetish pastry (with a little custard powder in it) as a base and on top, and she’d ice it with lemon icing. So yummy. Beautiful suggestions to enjoy with a cuppa, Catherine. Love them all but lemony things… mmmm. Isn’t Anne’s nomination wonderful? Absolutely delighted for her and The Autumn Bride so deserves it. Congratulations on your nomination. I thoroughly enjoyed the Autumn Bride. Looking forward to Winter Bride. Thanks EJ — it’s a thrill and an honour to be listed. So pleased you enjoyed Max and Abby. I hope you enjoy the Winter Bride as much. I’m sure you’ll have a ball with The Winter Bride, EJ! Andrea, I hope both the friands and the book hit the spot for you. The Winter Bride will do PERFECTLY, Andrea. All Anne’s books are gorgeous. Scones with jam and cream – say no more!! Yummm, I do love scones, jam and cream. Cheers, Janine. Say no more indeed, Janine! Scones with jam and cream: a treat that never ages. Congratulations on the RITA nomination. Hope you win it! And I can’t wait to get my hands on a copy of this book. Love the cover and like all your work, it should be a great read. Let’s see….I like the Cranberry Pecan scones made by Stick Boy Bakery in North Carolina. Those things are to die for and if you really must have a muffin, they make a killer ‘Everything’ Muffin that is truly amazing. Those muffins sound amazing. I almost never buy muffins, though — I make them when I’m expecting visitors or visiting someone and bake something to take, and that’s about the only time I eat them. Ooh, an “everything” muffin. How intriguing!!! I agree, Karen, the covers of The Winter Bride – both US and Australian – are beautiful. Anne has been well and truly sprinkled with cover fairy dust. Anne, I read the first book, and loved it, will copy your recipe…just to let you know I don’t have the patience to wait for the continuing series…giggling, I will endure! so sorry, I got excited, my favorite…orange scones with a glaze. Easy to get excited when talking about Anne’s books and food, Juanita!!! Orange scones? Now they sound interesting. Which has just made me think that orange friands would work lovely too. Orange scones, Juanita? Like Cathryn, I’ve never tasted orange scones, with or without a glaze. Sounds interesting, though. Hi Juanita — thank you. I am writing as fast as I can. I hope you enjoy The Winter Bride — I had a lot of fun with it. And let me know how the friands go. Big congrats on your new release. I can’t wait to read it. I’m having an Anne Gracie-a-thon at the moment, reading through all your books and I love them each time I read them even more. They make me smile on days when everything is working together to make me cry. In regards to what I love to eat with a cup of tea, well that changes depending on the time of the year. RIght now, I can’t get enough of crispy on the outside but gooey and buttery and golden-syrupy on the inside ANZAC biscuits. In winter it’s scones, jam and cream and in summer I love a fresh yellow peach or some cherries. Thanks Leisl — how lovely that you’re having a read-a-thon of my books. Thank you! And thanks for the congratulations. As for nibblies, I do love an ANZAC biscuit – crispy or soft. And yesterday for breakfast I had strawberries and blueberries and the strawbs were just delicious — essence of strawberries. Ooh, I bet that read-a-thon is fun, Leisl. Lots of smiles in all those Anne Gracies. These sound delicious! How come I have never heard of friands before? I’ll probably see the word everywhere now. Being English, I still refuse to call cupcakes (or fairy cakes) “muffins”, and I don’t understand how they ever came to be called that in the USA. There is no similarity between the two things! Many congratulations both on your RITA nomination and on your new release. I look forward to reading why Freddie called marriage-minded females “muffins”! HJ, yes, that’s exactly what I thought when I first encountered a cake/muffin in the US — this is a cake. A muffin is like bread, only muffin-y and I wanted a proper English muffin. 🙂 But I’m used to it now — I think the thin end of the wedge was when i was given a muffin tray and tried a recipe for banana muffins. yes, they’re large cup cakes, but seriously yummy. The friands are yummy too. And whoops, sorry, I forgot to thank you for the RITA congratulations. Thanks — I’m delighted. LOL on the English vs US muffins, HJ. They are quite different. Bit hard to have your morning poached eggs on top of a toasted US muffin! Definitely a cuppa and chocolate and a good book! You can’t go wrong with chocolate, can you, Jess? Anne, so excited about your RITA nomination and wishing you the best of luck. Your muffins look delicious and I can’t wait to try the recipe. As we’re nearly into April, I’m looking forward to my favorites to have with a cuppa. Hot Cross Buns for Easter and Anzac biscuits for Anzac Day. Yum! Cath, love the new look site. It’s so cool about Anne’s Rita nomination, isn’t it, Suzi. We’re all proud of her! Glad you like the new site. I’m pretty pleased with it. Thanks, Suzi — yes, it’s very exciting. I do love an ANZAC — they’re my go to biscuit if I need something in a hurry — all the ingredients are usually on hand, and I mix the whole mix in one saucepan, so very little washing up (one of my priorities in life. ;)) And delicious. Yummy! I love muffins, thanks so much for the recipe. Muffins & a good book. Life doesn’t get any better than that. Good books are so important, Linda! And Anne’s are like getting cuddles. Thanks for dropping by Friday Feast! Thanks Linda — yes, small comforts are so important. Congratulations on the RITA nomination. Any kind of dessert goes with it, especially cookies. Dessert goes with everything, Kim!!!! Thanks Kim, it’s a lovely honour. And yes, dessert is a fine thing. I bet it goes down wonderfully, Paula! You always have interesting foodie things. Actually, there seem to be a lot of chocolate recipes in the index. Rare to find an author who isn’t also a chocoholic it seems! I’m new to Anne’s books, but I know they will be wonderful because the esteemed Jo Beverley recommended them. The excerpt above only proved she was right on the money. As for what I like to eat with my cup of tea, I’m partial to snickerdoodles. Thanks, Anne — Jo writes wonderful books, doesn’t she? She and I read each other’s April 1st releases so we could do a joint blog on the USA Today HEA blog. I hope you do enjoy my books. Now that’s a recommendation, Anne! You’ll have a lovely time with Anne’s books I promise. I had to Google snickerdoodles. Never heard that word before and now I’ve discovered something new. Thanks! LOL — I can’t decide whether you sound like the cookie monster or Homer Simpson, but I agree, cookies are good. Ones you can dunk in your cuppa, bn100? Maybe Tim-Tams to do a slam? The only correct answer: a good book. But lemon cake is good too. Good luck at the Ritas!! Ain’t that the truth, Diane! There’s definitely something wonderful about a lovely cuppa (or glass of wine) with a good book. A tasty snack like a slice of your lemon cake could only make it better. Thanks for joining in the Friday Feast fun. This book sounds fantastic. Can’t wait to read it. My favourite thing to have with a cuppa is a good book. I like to devour them word by word. Kirrily, a good book is a wonderful thing — I get quite anxious when I don’t have a book ready and waiting. I hope you like The Winter Bride and my Freddy. You will have a ball with Anne’s books, I promise, Kirrily. Meredith I love the sound of your tall dark and handsome cuppas — and with a sense of humour — be still my beating heart! Thanks so much for dropping by. Ha ha ha! Ah, Meredith, you always make me smile. Can I swap your tall dark and handsome for a redhead? The sense of humour can stay. That’s essential! Shortbread is yummy, I agree, Amanda. My nanna also used to make brilliant shortbread. Oh, I LOVE shortbread, Amanda. Good choice! And even better if it’s home made from Nanna! And thank you, everyone from me. It’s been a blast. A big special thank you to Cathryn, who had the stress of a new format for the blog, and had to approve every comment — thanks Cathryn, you’re a champ!